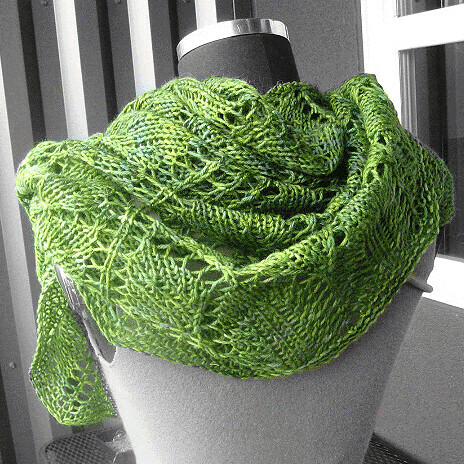 Thanks everyone for such a great response to my new Leaves Shawl Pattern (ravelry link to Leaves Shawl Pattern)! I knew I wasn't the only one who appreciated quick (500 yards!) lace in worsted weight yarn! This is a quick FAQ since I have seen a couple of the same questions (I'll add/update Q&A if I get more questions too). 1. Does the pattern have written instructions for the charts? Not yet, no. But enough people have asked that I might in the future! 2. Are the charts hard? If you have never knit charts before the charts may be a bit challenging if you don't know how to read a chart already, or if you do not know how to increase or decrease. The charts are large- they take up the full width of the page and are in color so they are easy to read. Each row of the charted lace pattern is only knit once (every lace row is charted), so you can cross it off when you have finished it to help keep your place. 3. Do I need long circular needles? No, I knit mine on a 24 inch circular.The stitches ended up squished pretty close together. At least 30 inches is easier to work with since you can spread the stitches out a bit more easily to check your work. I am partial to Addi Lace Needles since they have long and pointy tips. If you are buying needles for the project, get needles that are 30-40 inches long, since that will allow you to knit other projects with them more easily since you can use them for magic loop. 4. How much laceweight yarn would I need? Depends on how big you want to make it, I would guess you would need at least 1000 yards. 5. What do I do if I run short of yarn near the end? Eeek, we always hope this doesn't happen! But sometimes yarn labels or gauge is off. The easiest fix for this is to omit several rows of the edging at the end. 6. The cast on is confusing! I'm sure I'm just being dense. I'm having a problem at the center of row 9 of chart 2. The chart for that last section of the row, before the center stitch, and right after has 8 stitches available to use from row 8. However, row 9 takes up only 7 of them, leaving me with an extra stitch before I would be doing the yo and center stitch (same on the other side of the center stitch, of course). According to the chart, row 7 should be producing 8 stitches in that area, so it does appear that I should have the 8 stitches to work. Have worked this part of row 9 several times, left with that extra stitch every time, and counting the chart, what's there only uses 7. Are we just missing a ssk or a k2tog right before the yo and center stitch? I'm sorry, I don't want to guess and put the lean wrong and mess up this gorgeous pattern! Thanks for any help. Hi Angela- are you getting the k2tog at the beginning of the row(k3, yo, k2tog)? That may be where your extra st is coming from. I just made up a swatch of this chart- if you send me an email @ support (at) midnightskyfibers.com I will send you pictures of how both row 9 should look to make sure everything is lining up.